I just came across this from Kinowear, a blog devoted to style. Here, he talks about this month's inspirations from some of the top celebrities right now. I'm sure you can find a little bit of you in one of these people. If not, try and create an identity for yourself and associate yourself with one of these people. It's a hell of a start. Here's the actual blog post. So what’s the fastest way to improve my image? Many guys ask me to show them the right path to get on towards finding their best style. One thing I always tell them is to consistently model after stylish people they admire. Women do this all the time, and it’s the reason why the majority of them look damn good. They look at pictures of the best dressed in the magazines and on the internet, notice how every other woman is dressed out on the streets, and when they’re with friends they are either complimenting them on their fashion, sharing the latest trends, asking each other where they bought this or that, and even spend time shopping together giving each other opinions and what looks good and which things make them look fat. This is what is really missing with guys, and it sabotages us. In this age, image cannot be an afterthought. We all know how important the impressions we make are in every setting. If you want to become a stylish guy, it doesn’t take a lot effort to start focusing on finding some inspiration to improve. Anytime you see a stylish guy out in the street or restaurant, try to pinpoint and pick out what makes him look good. Take notes in your mind. This is crucial. If it’s his clothes, notice what he’s wearing and how he has put his outfit together. If something is not right, figure out what looks wrong and what he could change to improve. If you’re not already doing this you should start for your own benefit. If you can’t find any guys to model after in person, there is a plethora of magazines and pictures on the web that you can get inspiration from. When you see something you like, try to immediately add it to your wardrobe, personality, or appearance. This is what successful men do, they are always looking to improve themselves in any way. These are some examples that have inspired my clients to add that needed element to their swagger and you can use these examples for yourself now. Maybe something will speak to you, and you’ll go apply it right away. 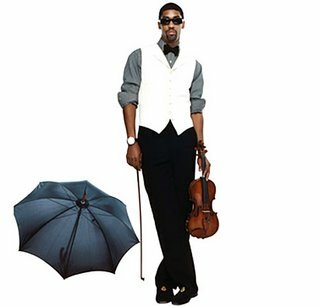 Known to be bringing back the “gentleman” that’s in all of us, Fonzworth Bentley reminds us that it’s important to hold a certain amount of grace and proper etiquette. He even wrote a book on etiquette and style. Fonzworth is the type of guy that advocates standing up when a woman enters the room. He should remind us to never throw out your basic manners just because you’re out with close people. That means be aware that spitting, burping, talking with your mouth full, or answering cell phones during a dinner with someone are all things that people will attribute to who you are. You are what you do. Period. Be a gentleman around women and they’ll love you for it. Nowadays guys are afraid to say “please,” “excuse me” and “thank you” because they’re afraid it’ll make them seem weak. Being a gentleman means respecting other people, and that does not make you a wuss. So don’t hold off on these things. We all know it’s not what you say, it’s how you’re saying it. If you’re always trying to please people instead of just having a healthy level of respect for your fellow man, that makes you a wuss. But being respectful and showing that you have a concern for other people’s comfort makes you a cool guy. 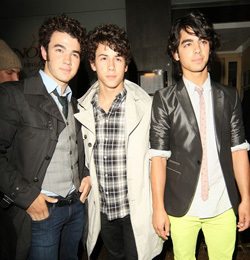 The Jonas Brothers seem to be more popular than ever because I see their pictures everywhere. I noticed that these boys have some hip style to them and there are some outfits and looks that you may want to steal from them. These guys are definitely dressed by stylists and their use of colors, accessories, and the way they put together their outfits down to the details is something that should be observed carefully. I’m a fan of Maroon 5, and I laugh whenever I see Adam Levine because he used to be a plain t-shirt and jeans type of guy, and then he really took his image to the next level as his band starting getting more popular. Hey, it’s all about branding right? Anyways, this is a great look that you can steal for a night out to the club this weekend. One thing I’d definitely make sure you own is a solid dark pair of jeans like this which are always more dressier than a lighter pair of jeans or ones that have been distressed. Put away the jeans with holes and crazy washes, and go for something solid and clean to dress up your outfit while keeping it from getting too formal. I know the “hoodie layered under a jacket” is not a new look, but I just think this outfit Ne-Yo is wearing is so great for a casual night out. This outfit has perfect balance. He’s got a leather jacket that gives him some bad boy edge and lightens it up with subtle color through his matching zip-up hoodie and belt. The hat and the necklace definitely add the right touch of personality. Steal this look for your casual nights out. Sometimes David Beckham can be too metro for the normal guy’s taste but then there are times where he has the perfect balance of masculinity and feminity. 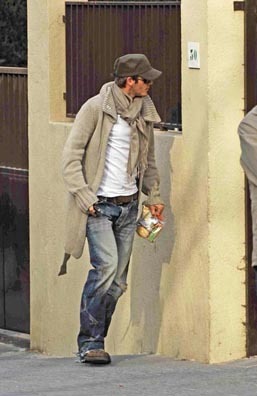 He’s wearing a long sweater coat with a scarf but keeps the masculine balance with his distressed jeans and boots. Remember to keep this type of balance in your outfits. Don’t be afraid to grab “feminine” pieces to add to your wardrobe. Think ahead when purchasing clothes and picture what masculine pieces you can mix it with. I see too many guys just grabbing “masculine” pieces like heavy graphic stuff, and they look too busy and try hard with no class. 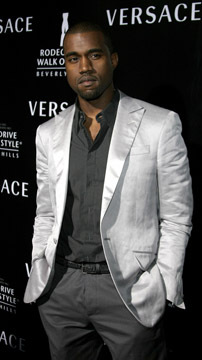 This blazer Kanye is wearing still makes him stand out and get noticed, but he doesn’t overdo it. Remember that when you’re wearing a flashy piece like this, you want the rest of your outfit to be very understated and simple. 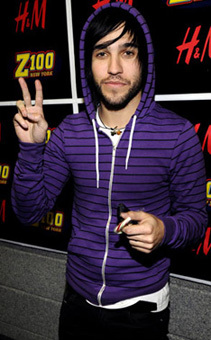 Pete Wentz is known for always wearing a hoodie, but whenever I see him wearing one it’s loud and fun to match his personality. If you love hoodies, consider getting one in a bright color or cool design. If any part of your personality can relate to this “punk” style, search for some similar hoodies and steal this look. 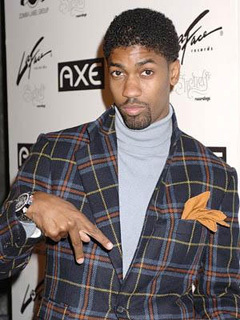 You should see a picture like this and get inspired to get a velvet blazer. Not inspired? Well it works amazing as a fall jacket that you can wear at anytime of the day. Wear one with a plain shirt and jeans during the day, and with a dress shirt and slacks to an evening party. Very versatile, very elegant. If you don’t own a pocket square, something is seriously wrong with you. Just kidding. But if you wear a suit to work, even if you don’t wear ties to the office, get a pocket square to add some pizazz to your look. Try it, you’ll be surprised at how many nice compliments you get. I love wearing dress shirts all the time, but with a pair of slacks and a black belt it could look like you just got off work. In certain settings, this may not be the look you’re going for. All you have to do is get a white belt and open another button if you’re daring and now you look like you’re ready to party. Going straight from the office to meet with friends? Keep a white belt in your car and you have an easy outfit change. Look for inspiration everywhere you can. People in the street, magazines, music videos, celebrity photos, to advertisements. Great style is everywhere if you keep an eye out for it.